Little Harry with the big fringe takes his bucket of dinosaurs everywhere with him in Whybrow’s series of picture books. 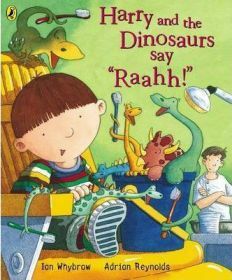 At the start of ‘Harry and the Dinosaurs say “Raahh!”‘ Harry is busily cleaning his teeth in preparation for his first visit to the dentist. He is a little afraid because elder sister Sam has shown him her filling. His dinosaurs are hiding but they all jump in the bucket when he calls them, except for Tyrannosaurus who has so many teeth he is worried that the dentist might have to drill them. Harry reassures him by telling him that he will press the magic button on the bucket to make Tyrannosaurus grow big, and off they go on the back of mum’s bike. When Harry goes into Mr Drake the dentist’s room, he isn’t convinced about the promised ride in the chair that goes up and down. Mr Drake lets him put Tyrannosaurus in the chair, and while his back is turned Harry presses the magic button to make Tyrannosaurus bigger. As the dentist turns round again, Tyrannosaurus lets out a tremendous roar that scares Mr Drake into hiding behind the door and asking for Harry’s help. Harry quickly presses the button again to reduce Tyrannosaurus to his bucket size. Harry now feels much more confident about sitting in the dentist’s chair, and Mr Drake assures him that there is no need to use the drill; he will just have a look at Harry’s teeth and give him a mouthwash to rinse with. Of course the dinosaurs have to rinse as well, and one of them disrespectfully spits the mouthwash right in Mr Drake’s face to Harry’s great amusement. On the way home Mum lets Harry choose a book from the library, and the dinosaurs are delighted that he chooses one about sharks because there are plenty of sharp teeth involved. This story is much more fun than the usual kind of book about going to the dentist. It would probably encourage a child to feel more confident about going if they took a favourite toy along. The episode where Mr Drake is frightened of the Tyrannosaurus shows that adults, even dentists, are vulnerable too and get scared sometimes just like children. Rinsing with the mouthwash is shown to be great fun, and drills are unlikely to be needed for very young children. The double-page spread at the beginning and end of the book showing dinosaurs of all shapes and sizes wielding toothbrushes and squeezing toothpaste is a great way of showing children that brushing teeth is just like a game. Adrian Reynolds’s illustrations for the book are big, bold and colourful. Expert young children can have fun identifying the different types of dinosaur, or just enjoy the unexpected incidents in Mr Drake’s room. The text is in a large, clear font and only in a few instances are there more than three lines to a page, superimposed on the pictures. This is obviously intended to be a picture book to read aloud to very young children, but young readers who are gaining confidence might enjoy having a bash at it too. They might need help reading the names of the dinosaurs, or of course they might just surprise you! There are a few parents who feel that mention of the dentist’s drill in the story is too frightening for the very young, but the fact that Harry does not need it helps to reassure them that they are unlikely to either. Children are probably going to hear and see the drill at the dentist’s, and it is better to have discussed it beforehand rather than having to come up with a last-minute explanation. No Comments on "Harry and the Dinosaurs say ‘Raahh!’"